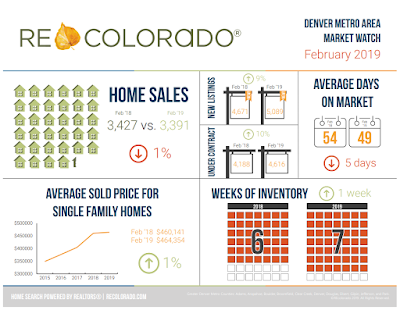 According to the latest marketing statistics from REcolorado, the Denver Metro market hit a five-year high for new listings in the month of February, giving buyers more options, especially in the $300-500,000 price ranges. There is currently 7 weeks of inventory, 1 week less than January and 1 week more than last year at this time. In February, home sales decreased 1% from last year, but are up 16% from January, which is a sign we’re heading into the busy buying and selling season. The number of homes that moved to Under Contract in February was 10% higher than last year, indicating it was an active month. Additionally, homes are continuing to sell quickly, in an average of 49 days, five days faster than last month and last year at this time. The rate at which home prices are increasing continues to moderate, with the average price of a single-family home rising to $464,354 in February, up 1% year over year.